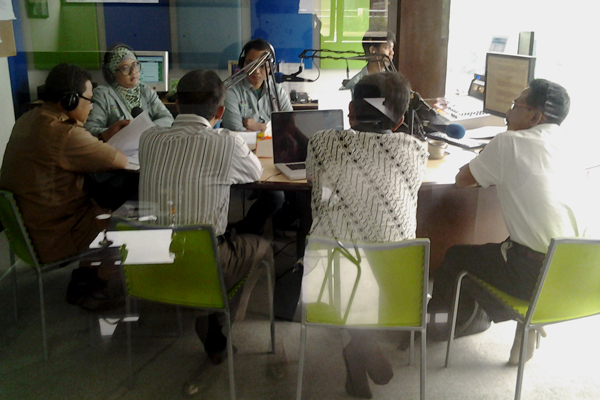 As a part of TA ADB 7189 Awareness Raising and Communication activities, the first talkshow conducted on 3 July 2013 in two radio stations (PRFM and Rase FM) in Bandung. The first talk shows introduced audiences about the need for considering the climate changes and its effects to the CRB. The resource persons were from Mr. Haneda Sri Mulyanto and Mr. HariWibowo (Ministry of Environment), Mr. TulusSibuea (West Java Province for Environmental Management Agency), Prof. Rizaldi Boer (Team Leader), and Dr. Siti Amanah (Communication and Community Empowerment Specialist). It was explained in the talk shows that to promote the situation in CRB, strength commitment from the government is needed, and supported from private and the community participation. Through ADB TA 7189 E, the government of Indonesia with the technical assistance from the ADB intends to strengthen the institutional aspect of the integrated water resources management to respond the climate change.